ANDREW JACKSON. 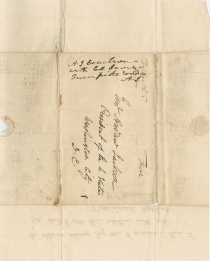 Autograph Endorsement Signed with Initials, ca January 1837. 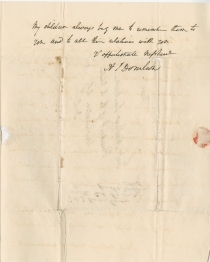 On ANDREW JACKSON DONELSON, Autograph Letter Signed, to Andrew Jackson, January 22, 1837. 4 pp., 8 x 10 in. A. J. Donelson. / with Col Love. / Turnpike road. 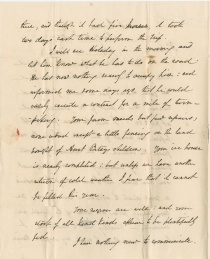 You will see from the enclosed letter of Col Love that he has subscribed in your name for a mile of the road running thro’ a part of Mrs Wards land at $4250. I did the same for myself before the receipt of this letter, taking the mile from the church in the direction of Scotts branch. My undertaking is a more difficult one that yours, but I am willing to sacrifice a good deal to obtain a good road. You can scarcely form an idea of the trouble we encounter in travelling now to Nashville. I have been compelled to send my waggon twice <2> there, and though it had five horses, it took two days each time to perform the trip. I will see Holaday in the morning and let him know what he has to do on the road. He has now nothing [?] to occupy him: and informed me some days ago that he could easily execute a contract for a mile of turnpiking. Your farm needs but few repairs, none indeed except a little fencing on the land bought of Aunt Betsys children. Your ice house is nearly completed: but unless we have another return of cold weather I fear that it cannot be filled this year. Your negroes are all well: and your stock of all kinds appear to be plentifully fed. I have nothing new to communicate. <3> My children always beg me to remember them to you and to all their relatives with you. Tennessee witnessed the beginning of a road-building boom in the 1830s. Turnpike companies flourished, regaining their investment and making a profit by charging tolls for the use of roads. From 1829 to 1836, nearly a dozen turnpikes were incorporated in Davidson County, Tennessee. On February 12, 1836, the legislature authorized a turnpike from Nashville to Lebanon, a distance of thirty miles. 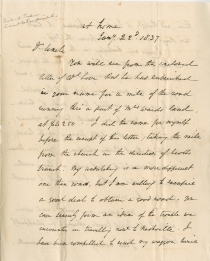 Just over a month after his wife Emily died of tuberculosis, Donelson wrote to President Jackson about the poor state of roads to the Hermitage, Jackson’s plantation. Although it was fewer than twelve miles to Nashville, the journey took a wagon an entire day to complete. Colonel Charles I. Love (1774-1837), a commissioner for the Lebanon Turnpike, had subscribed to pave a mile of the road on Andrew Jackson’s behalf. Love died six months later. Andrew Jackson Donelson (1799-1871) was the son of Samuel Donelson, Rachel Donelson Jackson’s brother. When Samuel Donelson died in 1804, Rachel and Andrew Jackson raised Andrew Donelson at the Hermitage. Donelson graduated from the United States Military Academy at West Point second in his class in 1820 and served as his uncle’s aide-de-camp in the Seminole War. After leaving the military, he practiced law in Nashville. Donelson married his cousin Emily Tennessee Donelson in 1824. He aided his uncle in the 1828 presidential campaign and became his secretary in 1829. His wife Emily served as unofficial First Lady and White House hostess from 1829 to 1834. When she became ill, she returned to their new home, Poplar Grove (later renamed Tulip Grove), near the Hermitage. Emily died of tuberculosis in December 1836. He served as minister to Prussia from 1846 to 1849. In 1856, Donelson was an unsuccessful vice presidential candidate, on the American Party or “Know Nothing” ticket with Millard Fillmore. Andrew Jackson Donelson to Andrew Jackson, January 20, 1837, Andrew Jackson Papers, 1775-1874, Manuscript Division, Library of Congress, Washington, D.C.